So you're thinking about having surgery on your vocal cords! Microlaryngoscopy is surgery where you are put to sleep and while an anesthesiologist takes care of your breathing, a surgeon can work on your vocal cords through your mouth using a microscope to see them in detail. Here are some things you might want to know about this type of surgery. The surgery is often utilized to remove something, such as a mass, nodule, polyp or tumor. It may also be utilized to cut or remove scar tissue or inject materials into the vocal cords. It allows the surgeon to work on the vocal cords without cutting through the skin. Because the vocal cords are far away from the mouth, long instruments are utilized to reach the vocal cords. Lasers may also be utilized to cut tissue without bleeding. Since the vocal cords are only about 2 cm long (< 1 inch), some type of magnification is typically utilized so that the surgeon can work in detail. Microscopes offer enlargement, but the telescopes are also utilized at times in order to see around the corners in the larynx. In the operating room, here's how I think about removing one type of lesion, in this case, vocal cord papilloma. I listen to your voice, assess your vocal capabilities and use an endoscope to look at your vocal cords. I record all of this, reviewing the recordings with you so that you understand what is going on and what you can expect to be different after surgery. Then we have a PARQ conference. PARQ is an acronym for Procedures, Alternatives, Risks and Questions. Procedure: In this case the procedure is a microlaryngoscopy, putting a tube in your throat while you are asleep in order to view and work on the vocal cords. I accomplish this sometime within the month before your surgery, otherwise the problem higher risk of having changed. There is nothing quite like going to sleep, not needing the surgery and getting charged a few thousand dollars for that brief sleep - I don’t think you even get a good dream out of it. Alternatives: We discuss any alternatives to the chosen surgery, such as living with the problem or undergoing speech therapy or even considering different surgical options. Risks: This includes both the potential things it could go wrong at the time of surgery as well as the possibilities that the outcome doesn't turn out the way we expected to. I will go into more detail below. Questions: I give you the option to ask any further questions but I haven't answered already during this pre-surgery visit. You will typically get another chance to ask questions on the morning before surgery in the pre-surgery waiting area. The main risks of the procedure are anesthesia, chipping a tooth, a sore or numb tongue, and a less-than-expected beneficial outcome. Other potential risks could be bleeding, infection, or breathing difficulties. If a laser is used, additional risks should be mentioned. The risk of anesthesia is that you would have a major life threatening reaction to some medication. This is very uncommon and I would compare it to getting in your car and driving some distance which puts you at risk of an accident and dying. Even though the risk is serious, it is apparently, acceptably small, as most of us continue to drive. In the case of surgery, you even have the added benefit of life support equipment and trained personnel standing by. Still it is a risk for you to consider. If you have no teeth, the worst you can expect is a sore upper gum. For others, when the laryngoscope is inserted it puts pressure on the upper front teeth. Several variables enter into the amount of pressure put on your upper teeth. The bigger your tongue, the narrower your lower jaw, the greater your overbite, the less you can open your mouth, then the tighter the fit will be for the scope and the more pressure on your upper teeth. Additionally, if you have spent your children’s inheritance on caps on your incisors, you may be at additional risk since they may be a little weaker. Large cavities or other degradation of your tooth strength may put you at risk for a chip. I also find that the lower teeth, typically the canine teeth are often a pinch point and have pressure put on them by the scope. Individuals who had radiation therapy often have weak teeth. I typically place some type of plastic or rubber guard over your upper teeth to try and reduce this complication. Individuals who have teeth aligners such as Invisalign may wear them and they seem to offer excellent protection. Overall, I think of this as an intermediate risk complication. The opposing pressure to your upper teeth is the tongue. It gets pinched between the laryngoscope and the lower jaw. Often, it gets pushed more toward one side. Just like your leg going to sleep, the nerve to one or both sides of your tongue may fall asleep from the pressure on it. In my experience, this happens to perhaps 25% (an educated guess based on my personal experience) of people and may last for several weeks. It may feel like your tongue is fat or moving poorly. Some people notice their speech feels a little slurred. Some people notice an alteration in the sense of taste. My experience has also been that normal sensation eventually returns to the tongue. This may range from a day up to 4-6 weeks. Unfortunately, your body is not a car and we cannot go to the body shop and just put on a brand new fender. The surgeons skills, your bodys healing capabilities, tendency to scar and the type of disease present all enter into the equation of that attempted perfect result. Therefore, while everyone; surgeon, anesthesiologist, nurses and other staff strive to provide excellent care, in all likelihood perfection is tempered by the human condition. Still many results are excellent, some are good and rarely the outcome is poor. Your surgeon will likely temper your expectations based on the type of disease being treated as that has a major effect on the expected outcome. This has not been a significant risk in my experience. Anytime a cut is made; there is the risk of bleeding. If you are on any medication that may thin the blood, that can increase the risk. Examples of medications that might prolong bleeding include Coumadin, aspirin or even vitamin E. You should go over all medications that you take with your physician before surgery. Even given these risks, the cuts in microlaryngoscopy are typically exceedingly small and though under the microscope, it may look like a lot, it is typically miniscule. The exception might be in the case where you have some unusual tumor made up of blood vessels. This almost seems like a theoretical risk, it has been so uncommon in my experience. Certainly, any time a cut is made, that becomes a route for bacteria to potentially enter into the body. For some reason this is extremely rare in laryngoscopy. Perhaps because the cuts are small, perhaps because the upper airway has a very good defense system. Still, it is possible. This has been much less common in my experience than it would seem to be based on logic. The voice box and windpipe are of a limited size and even the somewhat common infection of laryngitis can occasionally turn severe enough to make breathing difficult. There is almost always some swelling after working on the voice box. Your surgeon will usually be able to predict the risk based on how much is being done. Medications, particularly steroids, can help decrease swelling if it occurs. The laser is a wonderful, precise tool that cuts and stops bleeding at the same time. This controlled burn can cause harm. Many safety measures have been put in place because of the laser’s capabilities. Because of these safety measures, the risk of a complication is very small, but here are some of the potential risks. The typical laser used is the CO2 laser; other types of lasers may have special roles. The CO2 laser can injure the eye, so the eyes of the staff and the patient are covered with protective eye gear. If inadvertently fired, the laser will burn whatever it contacts. Therefore, everything near the laryngoscope is typically covered with wet towels. Since the breathing tube contains oxygen, it is at particular risk of burning. Special (read expensive) tubes have been designed that have a protective metal or other coating on them. Your anesthesiologist will use the lowest concentration of oxygen possible during lasering. The surgeon may put wet cotton sponges behind the vocal folds to catch any stray laser beams. You might wonder how could my surgeon miss my vocal folds? Even though you are asleep, you are still breathing and that generates some movement that can be significant under the microscope or the lesion to be removed may be on the very edge of the vocal fold and the last cut will pass out the backside of the fold. Still, the laser is a safe tool when used properly. I will ask you to sign an informed consent form before going to surgery. 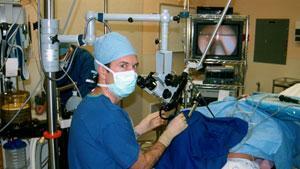 When microlaryngoscopy is performed in the operating room, it is usually done with the patient asleep. You may hear by phone from your anesthesiologist the night before or you may meet him/her the morning of surgery. You should tell them of any problems you have had in the past or any concerns you have about having anesthesia. In particular, if you have had trouble with nausea or vomiting in the past, your anesthesiologist may be able to adjust your medications to decrease the chance of stomach acid irritating your vocal folds as it comes back up. In the preanesthesia area, you get to wear that famous "open back" gown. You will be there for about an hour answering many questions for the tenth or perhaps the twentieth time. You learn that you actually lead a very interesting life judging from the thickness of the stack of papers representing you in the medical record. From there, you leave your family and ride on your back, staring at the ceiling, to the operating room. The operating room table is often pre-chilled (I warned you). You will be put to sleep with medicine through a vein and may have a mask on to breathe some oxygen while falling asleep. After you are asleep, your head is tipped quite far back. The surgeon sits at the head of the table, essentially above your head. An instrument called a laryngoscope is inserted through your mouth so the surgeon can see down your throat past the back of your mouth. The laryngoscope is a hollow metal tube that when placed in the proper position allows a direct view of your voice box. It pushes the teeth and the tongue out of the way. To protect your teeth from chipping, a rubber or plastic tooth guard is placed over your upper teeth. Your neck is extended so that the surgeon has a view straight down your throat from above. It is a bit like sword swallowing. Your eyes are closed and padded for protection. If the laser is used, wet towels are placed over and cover your face completely to absorb the laser beam if inadvertently fired. The surgery is delicate and a bit tedious but not difficult. It may take about an hour to perform a typical surgery, though this varies a lot. Many types of procedures can be performed during a microlaryngoscopy. Some typical procedures would include using long (about 12 inches) delicate forceps to grasp and hold a nodule. Then microscissors are used to remove the bump. Sometimes fluid is injected into the vocal fold to push a surface bump away from the underlying structures before it is cut. The laser may be used to vaporize an unwanted blood vessel. A tumor may be cut out with the laser. Scar tissue may be cut with a knife, fat may be implanted, the incision in the vocal fold may be left open, and in uncommon cases, it may be sewn shut. A biopsy or small sample may be taken to find out what disease is present. I cannot personally think of an occasion to strip a vocal fold. Use caution, if you hear that term. That procedure can cause more harm than good. You wake up rather quickly and find yourself still in the operating room or in the recovery room. You stay in the recovery room until the nurses and anesthesiologist are certain the majority of the anesthetic is gone from your system. You then return to the day surgery area where you started. When you can stand steadily, keep liquids down without nausea or vomiting and can go to the bathroom (essential human activities) you may go home. The whole process takes up a good part of the day. Typically there is minimal pain after surgery. Since this varies from person to person and procedure to procedure, I prescribe Vicodin. Vicodin is essentially Tylenol and a narcotic, hydrocodone. For some, this is a less nauseating option than codeine. This may be used for either throat pain or for a throat tickle or cough. Many find that Tylenol is sufficient for the pain. An over the counter option for cough is dextromethorphan. It is the DM in medications such as Robitussin DM. There are extensive options for management of pain. These are my particular inclinations and I vary them depending on what I am doing on the voice box and what the vocal needs are of the patient. Expect a wide variation in recommendations from myself as well as others. Feel free to drink plenty of fluids to keep secretions thin. I suggest that you rest your voice for 1 - 14 days depending on what lesion is removed. This means essentially no talking. My belief is that the raw edges of tissue need an initial chance to heal. You know that if you pick at a cut on your skin, it will keep bleeding and make for an uglier scar, likewise the vocal folds. Even when I suggest voice rest, I will often suggest that you hum or sigh gently about six times a day for a 2-3 minutes to get some gentle vibrations massaging the vocal folds. Then, as the edges of the cuts begin to stick down, you may begin talking. Some of my patients sneak in a few words, as they can’t resist the desire to talk. While I don’t recommend talking, here is what you might experience. On the afternoon of the surgery, you voice will be pretty good, usually better than before surgery. Then, swelling sets in since your vocal folds are bruised and your voice will sound deep, rough and laryngitis-like. It will require a little extra effort to talk. You may begin talking, though I would like you to pretend that you do not like to talk and keep it to a minimum initially. Talk perhaps 10% of your normal amount at first. Pretend that you are a 1 on the 7-point talkativeness scale. Ask your close friends and family if you are behaving like a 1. Their answer will likely surprise you. If you sing, you may do five minutes of easy warm up per day. I typically see a professional voice user back one week after surgery to determine if further rest is indicated. I expect to see some swelling and bruising but would like to monitor your healing phase. Your voice will sound like you have laryngitis from the swelling. This improves quickly at first, then more slowly. You are getting there. Talk about 50% of normal, sing, but not at a performance level. I have had people sing a performance this early, but I am nearly certain they do not get as good a surgical result. If you talk all day, you could vibrate your vocal folds one or two million times. That is asking a lot from a healing incision. Be patient. Your voice should continue to improve. If you are a singer, you should gradually be reaching some higher notes with greater ease. Pretend you are a 4 on the 7-point talkativeness scale. Increase voice use to about 75% of normal. If you saw a speech or voice therapist before surgery, it would be a good idea for a follow up visit to confirm that you are doing the appropriate behaviors. IF your physician feels you are ready, resume your singing practice and warm-ups. I would consider the warmup recommendations of one of the country’s most outstanding vocal scientists, Ingo Titze. You might have your therapist interpret some of his suggestions if you are unfamilar with any of the terms. Return for a follow up visit to see if you are healed. If I operated on you for a lesion that was caused by talking often (you are a 6 or 7 on the talkativeness scale), remember, I have not operated on your brain. It is up to you to give your voice the chance to rest that it needs. Being innately talkative is a wonderful personality, but can be vocally expensive. If you are a singer, you should be performing the swelling tests to monitor your vocal folds. Follow up recommendations vary a lot depending on my judgement about the underlying problem and its likelihood of recurrence. Depending on your problem, I may suggest a follow-up at this longer interval. Long term evaluation of your surgery.